After very , very wet week, a ‘gang’ of willing helpers, built this years bonfire, erected gazebos and went shopping for food and fireworks. A number of staff collected their new corporate clothing, if you haven’t got yours yet, contact John R. Eric C. to arrange. The gates opened (officially ) at 6.00 p.m. but a few folk did come earlier. 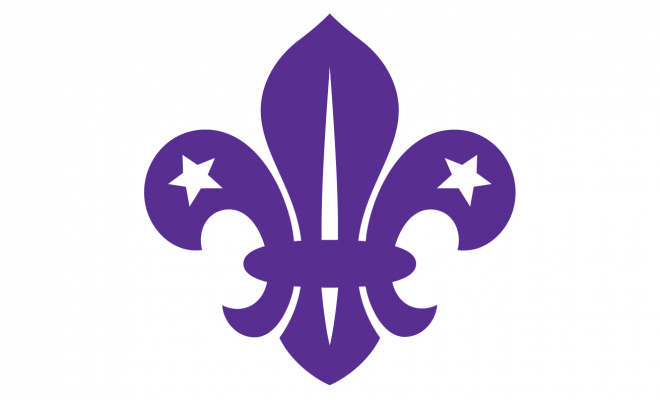 Everyone was ‘car parked’ in the top field under direction of Terry L. and both Districts Explorer Scouts units , only one or two mishaps ensued. Thanks to terry L. we are amply lit up this year. 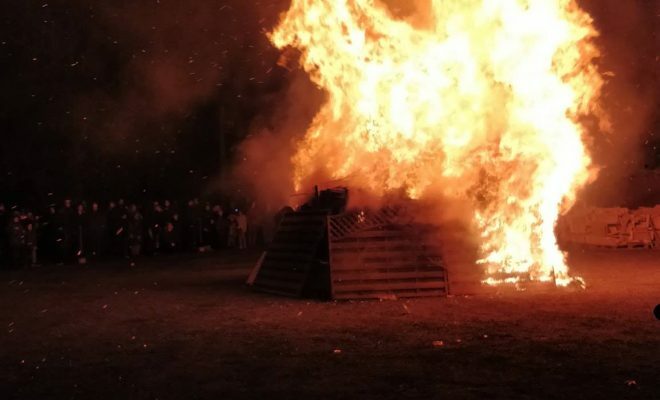 The bonfire was lit at 6.30 and because of all the wet……..Yes it struggled, with help from Mark S. Richard D. and a gallon of paraffin, finally the fire took hold and everyone finally warmed up. 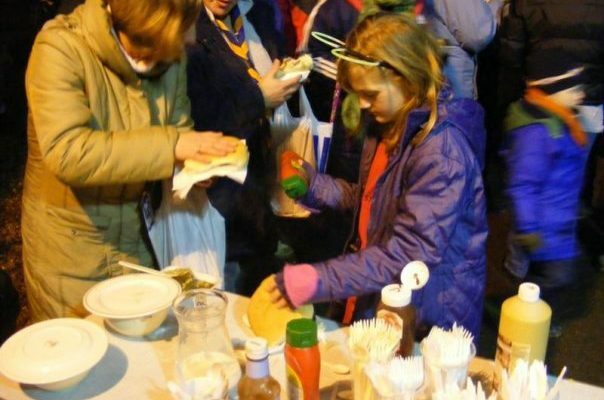 Also at 6.30 Wendy F. Dorothy H. Anne D. and Sharn R. plus help again from Explorers cooked and served Pie and Peas, Giant hot dogs, quarterpounders to the thronged masses who had bought a bargain £1.50 ticket for each course. Sharing the decking was John B. (alias Arkwright ) with his table of glow products, ( sticks, glasses, ears, and earings ) sweeties and canned pop. Inside the ( licensed ) bar was amply stocked ( except not enough Guinness and cider ) with ‘tinnies’ this year, sold by Adam S. and Eric C. this year we turned in a profit on the bar, and still have some stocks to sell at reasonable bulk prices to over 18’s. just see Eric C. or John R. for prices. At 7.30 Simon W. accomplished his annual ambition and let off as many fireworks as possible as quickly as possible, unfortunately this year some were also damp, we the display turned into a bit of a 2 halves thing. We started to clear up after eight ( get the chocolates out…..) and managed the bulk by 9.30. Thanks to all the efforts put in by everyone, again we learnt a bit more and we even made a small profit this year, this will help towards the many new developments going on “up at the site”.